Welcome to my blog, OnlineHomeIncome.in – A blog that will you show you the way to success. My name is Myilraj. G, a full-time blogger from India, living my own life without Boss. Running this blog with an intention to create a more new entrepreneur’s on my network. 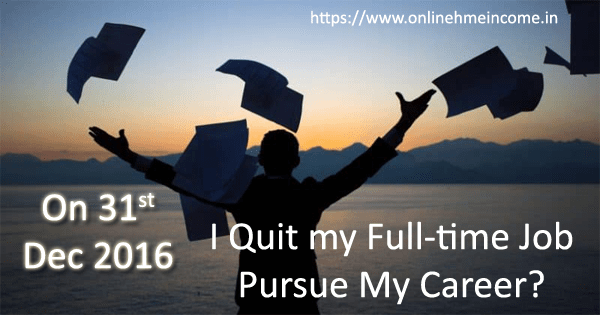 I started blogging in 2013 – keeping in mind to support all people to know about the different ways to earn money through Online Jobs without Investment. I started my first online business in 2008 (probably I was studying the pre-final year of my college) on the free Blogspot platform. The blog was no more, but it had taught me how to start my own business? After I completed my college studies, I went for the job due to family circumstances. Between them I reduced my online presence for two years 2011 – 2012 and later, during the early 2013’s March, I registered my first domain Online Home Income. I do not aware of CMS such as WordPress, Blogger’s Blog because I discontinued working online between these two years. But my passion was not discontinued and it pushed me to learn HTML based web-design. I referred to nearly 100’s of books and online resources to learn web-design. I designed my very own blog on HTML and launched on 11-03-2013. My first intention was to build my own business start-up and this blog was my foundation. I started sharing my online businesses such as Paid to Click, Surveys, Traffic Exchanges and Affiliate Marketing (But it was entirely new to me). I struggled a lot during the beginning months but while days passing, my blog reached out to more audiences. First I should thank Facebook, Google Orkut (Now no more) and Mobile networks in India that helped a lot to reach more new audiences. While days passed by months, and months passed by Years, still Online Home Income was live in 2018 crossing its 5Yrs of the online journey, that had thought millions of people to earn money from their home. Most of the people in the world have a dream of living a life with complete financial satisfaction. But how to find the right way to achieve? The answer is Online Home Income. This statement motivated me and pushed me to achieve this stage where I am now making my full-time living by blogging and other online businesses. In Online Home Income, you can learn about the five successful ways of earning money online without investment. Making people start from Zero to earn 1000’s of dollars was the core mission of our blog. Online Home Income was started mainly to teach people about different online jobs I have shared on my blog. All methods are very genuine to begin today. Online Home Income recently launched a Free-Email Training Program for our audience to get trained by themselves. You can joinby clicking the below button. When I start my Blog, I am the one who managed all aspects and this year I planned to open my door to all Content Writers, Guest Posters etc. I planned to support people who wish to start a blogging business by providing them customized one-on-one personal training in their blogging career. I was born and brought up in Coimbatore, Tamil Nadu, which is one of the fastest growing cities in India and a major textile, industrial, commercial, educational, informational technology and healthcare hub of TamilNadu. With the emerging growth of software and information technology, Coimbatore itself has most of the IT companies from the world. Situated on the Eastern slope of the western ghats of India, Coimbatore has a stable climate all around the year that attracts most tourists around the world. After 2010, while going for Job I have been working online simultaneously whenever I found free time. I worked with several 100’s of online business websites and programs and found most of them were the scam. Because either the admin of the program run away with our money or else the program was halted at one stage (Not able to sustain anymore). If there is a bad, there is a Good. Still some sites proven to be Genuine over years and still paying me on time. With continuous effort and learning new strategies, I became self-aware to differentiate the legitimate online job sites from the scam. One fine day, I thought why shouldn’t we share our knowledge with other people and this idea has turned into the present project, “Online Home Income”. In this blog, I use to update new information and news about online job methods, online job websites, and review of online scams and projects. Recently I have started to cover more topics such as Business, Career, Money, Education, Part time jobs, Online Jobs. As my blog visitor, you can get yourself learned about different money making opportunities without being scammed. Online Home Income was one of the biggest milestones in my online career. This blog ranks on the top of Google India for most of the keywords. I started dreaming of my own free lifestyle and Online Home Income have made it become possible on Jan – 1 -2016 after 2.9yrs of the successful journey. During this journey, I have faced a lot of difficulties including but not limited to Moral distracts, family distracts, and technical distracts, I surpassed all those obstacles successfully and still growing towards the endless destination. After the successful growth of my blog “Online Home Income”, I have started several few blogs on a different niche to explore my knowledge to earn money. My journey always filled up with finding new ways and traveling towards a new destination. I finally invite you all new buddies to join hands with me to foster a financially free future. I would be proud to call myself a young Entrepreneur. Now, the dice is yours…. … .. .
Online Home Income was mainly started to educate every people to get a genuine alternate source of Income and to live a freestyle. In my blog, I share my own experiences and share Do-It-Yourself (DIY) tutorial on the five most successful methods of earning money online. My community blog serves as a dedicated source for finding legitimate online jobs from home. Online Home Income was a great resource for anyone who wishes to create their own fortune of financial freedom. This is not just a blog but my 9 yrs of my life experience and my growth from a digital nomad to digital geek earning a few thousand dollars a month from home. No.1.) Don’t forget to join my 2019 movement whose mission was to create 2019 entrepreneurs. No.2.) Never miss an update from Online Home Income by subscribing to our Newsletter. No.3.) Contribute your knowledge and share your experience by participating in my Guest Posting program. No.4.) Visit my official site to reach me quickly – myilraj.com.